the wash-bag acts as a filtration system for your washing machine. 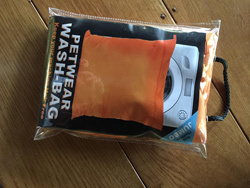 it works by retaining all pet hair inside the bag during the wash cycle, whilst allowing a free flow of water through the bag to clean your items. AFTER WASHING . . . any trapped pet hair can be easily shaken out of the bag, ready for re-use. HELPS PREVENT BUCKLE DAMAGE . . . the wash-bag also prevents buckle damage to your machine when washing items such as collars and harnesses. Great product, delivered in a really short time! Brilliant service. Thank you.